Motor skills, which refer to motions completed as the brain, muscles, and nervous system work in tandem, are vitally important. In fact, the importance of developing and perfecting motor skills cannot be overestimated since they will give your children the ability to get out of bed in the morning, walk up and down the stairs, tie shoelaces, button coats and jackets, and more. As it turns out, summertime presents a golden opportunity for outdoor activities that can help your children develop motor skills. Read on for a look at some recommended activities. If you live anywhere where there are hills, take the family out for some hill climbing. Your children will develop strength in their legs, fine tune their balance and coordination, and more. Be sure to have fun going up and down the hill — and if you’re all feeling adventurous and if it can be done safely, try rolling down the hill as well. You can make it even more fun by seeing who can get to the top of the hill first in order to add a bit of friendly competition to the activity..
It’s not what it might sound like! For this activity, what you’ll want to do is get a long 2×4 beam or plank and lay it out across your lawn. Then take turns walking the plank to see if everyone can work their way from one end to the other end without losing balance and stepping off. This sort of activity will enable your children to develop their sense of balance in a safe environment. Get your children involved in planting a garden. There are lots of motor skills-building activities involved in developing and maintaining a garden, and many of them will be suitable for children to take part in. Whether raking up leaves, planting seeds in rows, watering, weeding, or picking the produce, your children can develop their motor skills in the great outdoors while they learn useful skills that can serve them well throughout their lives. 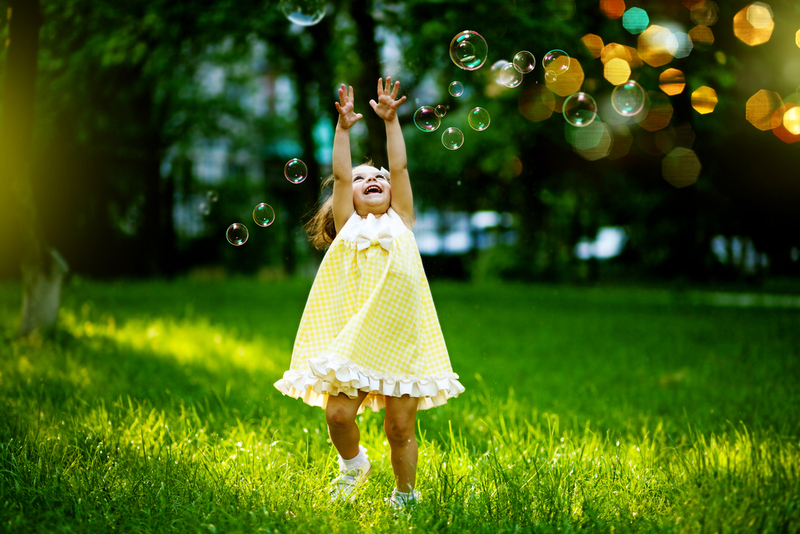 Blowing and chasing after bubbles is a fun summer outdoor activity that your children will love. You can get bubble blowing kits at relatively low prices at many retail outlets. Have your children blow bubbles and then run after them to pop as many as they can. They’ll be darting about and leaping in order to as many of the bubbles as they can. Flying kites with your children will give them a unique thrill. You can purchase kites or you can even make your own. There are lots of sites online that you can go to find out how to make your own kites. Once you buy them or make them, let your children experience the sheer fun of managing their own kite on a day when there’s sufficient wind activity. They’ll need to use various muscle groups and body parts to fly kites, and this will help them develop motor skills. Now that summertime has rolled around, there are many opportunities for outdoor activities that will help you children to develop motor skills. Try the aforementioned recommendation or think up some of your own. Just make sure to take advantage of the chance for some outdoor fun.